Last weekend, in scenic Asheville North Carolina, AC Entertainment and Moog Music teamed up to present a revamped and relocated version of the annual MoogFest; a festival celebrating inventor Robert Moog’s massive influence on the world of music. The festival spanned Halloween weekend offering three spectacular nights of music and two days of informative panel discussions and Moog instrument demonstrations. The music schedule offered a perfect blend of sonic innovators, high-energy dance DJs, and envelope pushing Pop acts that showcased the wide-ranging world of electronic music. The festival took over five music venues in downtown Asheville ranging from a makeshift nightclub in a gallery space, to a dive bar, to the Orange Peel (Asheville’s 9:30 Club equivalent), to the classy Thomas Wolfe Auditorium, all the way up to the cavernous Asheville Civic Center. 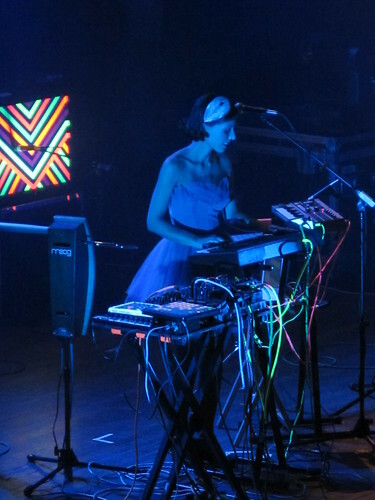 At times MoogFest felt like two festivals in one; the first, a large-scale non-stop dance party for the party hearty; the second, an equally entertaining but more cerebral music geek nirvana of Moog instrument-fueled performances. The beauty of MoogFest 2010 was watching and listening to these two different worlds of performers and audiences cross-pollinate all weekend long.